The company behind the established casino Casumo has launched a new brand on the UK market for casinos. By the first look, you can tell that it feels very professional and well thought-out. Something that you can expect since Casumo has become a real success the past years. The founders’ vision with the new slot site is that it should be fun, easy and trouble free to play slots. Key components for fulfilling such a vision is that payments must be fast, terms and conditions easy to understand and that customer experience must be a focus area in all aspects. 200% up to £50 and 180 free spins on Starburst. The wager requirement is surprisingly low with 25 times the money. In theory, that makes the first deposit a loss for the casino since the expected value for the bonus should convert the bonus into real money. That makes Dunder, a free target for bonus abusers or gamblers who just wants a good start at their casino. Dunder is quite limited with the information about what campaigns and bonuses they will offer once you have used the welcome offer. Taking the generous wager requirement and deposit bonuses in consideration, expectations are high that Dunder will continue to spoil their customers. 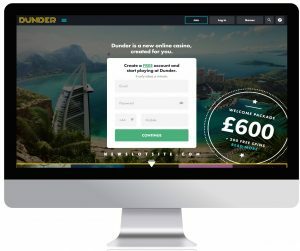 With the aim to establish the brand on the UK market, Dunder collaborates with the most popular game providers there is. With Dunders well-developed search function it is easy to search for both games and game providers but also different categories of games. That function is what makes Dunder unique to other slot sites. To search slot games on their site, origin or functions makes it possible to filter between slots that have expanding wilds, free spins, falling symbols or bonus functions such as locked wilds. Time can also be spent looking for specific themes such as horror, animals or Egypt. If you are into movies, you will most likely find your favorite slots under the category Blockbusters. Among other slots, you will find Dracula, Scarface, Terminator and much more. Except for classic slot machines, Dunder offers a wide selection of classic table games including both Roulette and Blackjack. Additionally, Dunder is pushing several live casino games working together with both Evolution Gaming and Net Entertainment. With a focus on quality and premium suppliers, Dunder offers over 800 games in total. Working with so many suppliers, it is obvious that they have excluded some games to only offer the best ones. Developers often talk about “mobile first” where the focus has been set upon creating the product for mobile devices and then adjust it, so it also fits into the desktop solution. For new casinos, that strategy is very common, and Dunder is no exception. With a navigation and interface which is easy to understand for all devices, a lot of so-called mobile casinos will get a challenge competing towards Dunder casino. With the vision to be perceived as a safe and honest casino and with an experienced team, Dunder knows how to take care of its customers if issues arise. The UK support is open from 11 am to 11 pm all days of the week where mail support is available 24 hours per day. Regarding payments and withdrawals, most payments are made within seconds. If your payment takes more than 24 hours, you are recommended to contact their support team. Most payments methods are free to use while Euteller and a few others charge 2,5%. The gathered impression by Dunder casino is professionalism created by a team that knows casino and slots that genuinely wants to create a good experience for their customers. The theme is cool and playful making use of a background, which looks like a fusion between Dubai, Las Vegas, and a tropical island. It comes with a luxury feeling but also something that feels friendly and cozy. The real selling point for Dunder is the possibility to filter between categories and of course the generous welcome offer.